You come to Key West to be on an island. The Paradise Inn is uniquely an island within an island, a traditional Caribbean compound offering ideal accommodations-true "Conch" architectural diversity set in a secluded, communal environment. Within lies an artful arrangement of historically significant and meticulously renovated one and two bedroom "cigar makers" cottages. 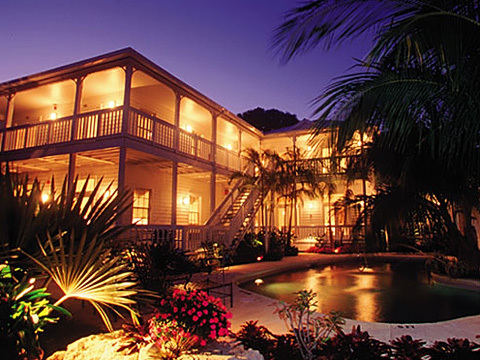 Additional suites are located in two authentically reproduced Bahamian-style houses with vine covered porches, sundecks and shaded balconies everywhere. Limestone and brick paths meander through the spacious grounds, landscaped with an impressive collection of indigenous and exotic tropical flora, from night blooming jasmine to gumbo limbo and red ginger....even the exotic ylang-ylang tree, from which Chanel captured its famous scent, Number 5. Daydream by the lotus pond where Japanese koi swim and lilies bloom. Unwind in the Jacuzzi or cool off beneath the palms in our fountain-fed pool. The Paradise Inn offers these other amenities for your pleasure. RECREATION: Large swimming pool in a lush tropical courtyard. Jacuzzi. Pool house. Nearby beaches for swimming. Sailing, snorkeling, fishing, parasailing, scuba diving, kayaking, walking and bicycle tours, all arranged by concierge. DINING / BAR: Complimentary continental breakfast served in lobby. Wide variety of restaurants and bars nearby. OTHER FACILITIES: Concierge. Multi-lingual staff. Guest fax service. Nightly turn down service. Free on-site parking. Sightseeing arranged Hemingway House, Pirate Treasure Ship. Audubon House. AIRPORT: Key West Airport - 2 Miles. Miami Int'l Airport - 150 miles.